Welcome, this is a new page for an ongoing project I have been working on for years. 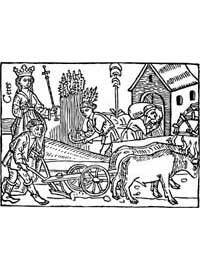 I love medieval history and a reoccurring theme throughout is the importance of land and agriculture to medieval society and its economy. These are just some of the areas I plan on addressing, and you know how plans work. So some ideas may never come to fruition and new ones may appear as time goes on. Some of the downloads I have done in the past will end up being associated with these ideas and new ones will be developed as ideas are explored and expounded upon. If you have ideas to include in these pages please feel free to contact me with them either through the HârnForum or by using the contact link below. © Roy Denton 2010 Updated September 8, 2010. For suggestions and/or problems contact the web manager.